The tridosha states of Kapha, Pitta and Vata are related to hemispheric dominance and endosymbiotic archaeal digoxin synthesis. The Kapha state has been demonstrated as equivalent to right hemispheric dominant hyperdigoxinemic state. The Pitta state has been demonstrated as equivalent to the left hemispheric dominant hypodigoxinemic state. The Vata state has been demonstrated as equivalent to the bihemispheric dominant normodigoxinemic state. 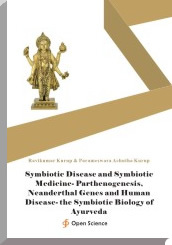 Actinidic archaea and viroids are related to the tridosha states of Ayurveda. Dietary fibre deficiency leads to increased endosymbiotic as well as colonic archaeal growth. Populations with low fibre intake have lesser density of colonic archaeal microflora and endosymbiotic archaea. Endosymbiotic archaea contributes to neanderthalisation of the species. Populations consuming a high saturated fat and protein diet with low fibre intake tend to get increased endosymbiotic archaeal growth and are neanderthalised. Populations with high fibre intake tend to have reduced archaeal density in the colon and reduced archaeal endosymbiosis contributing to homo sapienisation of the population. The neanderthalisation of the species due to archaeal endosymbiosis results in increase in incidence of metabolic syndrome, neurodegeneration, schizophrenia, autism, autoimmune disease and cancer. A species change by modulating archaeal endosymbiosis can result in change in the disease phenotype. This forms the basis of symbiotic disease and symbiotic medicine.